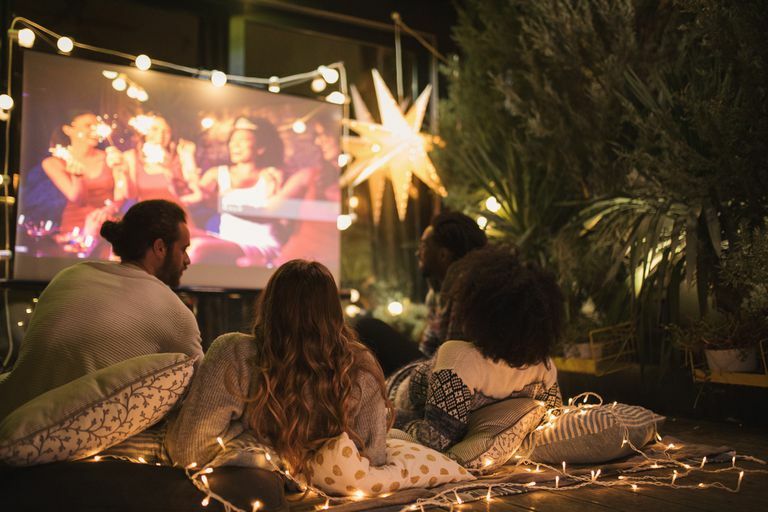 Home theater projectors are a great way of bringing that movie theater vibe into your abode. But displaying a Hollywood blockbuster on a plain wall or a bed sheet hung from the ceiling will often lead to less than exciting results. And purchasing a projector screen may not always be practical or right for your space. Fortunately, it’s not too difficult or costly to build a screen that works for you. Here are a few ways to build a home projector screen using easy to find materials. The size of your screen will depend on the space you have available. If you're building a display to use in a small space be sure to test your projector first to establish the size of your display area. Made of inter-connecting PVC pipes and a Spandex display, this freestanding portable projector screen is a great set-up if you want one that works both indoors and out. The materials are also relatively inexpensive. Plus it’s also quick and easy to put together or take apart, making it perfect for occasional movie nights and simple storage. These instructions are for a 10-foot by 5-foot frame, but you can adjust it to your specifications. You can buy the last two materials in the list from a fabric store, while the rest should be available at a hardware store. Take a 5-foot pipe and connect one end to a tee joint. Take a second 5-foot pipe and connect it to the direct opposite side of the tee joint, creating a roughly 10-foot beam with the tee joint in the middle. This setup will form the top of your frame. Repeat the first two steps to create the bottom of your frame. Attach a 90-degree joint to either end of your top beam. Connect a three-way joint to either end of your bottom beam. Fasten the top and bottom beams with a 5-foot pipe at either end. Now you'll have a rectangular frame that's roughly 10-feet by 5-feet. Connect a 1-foot pipe to the available tee joint slot on the top beam. Make sure the 1-foot pipe juts away from the frame at a 90-degree angle. Do the same for the bottom beam. Attach a 90-degree joint to the available end of your 1-foot pipe on the top beam. Take the final 5-foot pipe and connect it to the 90-degree joint. Use the 90-degree joint to secure the 5-foot pipe to the bottom 1-foot pipe. Your frame now has rear support. Connect the 2-foot pipes to the available corners of the bottom beam, thus creating extra support for the frame. Set the frame so that it's ready for the screen. To create the screen, fold the pearlized Spandex over on itself once. Secure the two sides with fabric tape, creating an envelope. Be sure to leave the bottom unsealed. Depending on the fabric tape you use, you may need to let the material sit for a period so that it bonds fully. Turn the Spandex envelope inside out so that the edges of the seams are on the inside. Pull your Spandex screen over the top of the frame. Draw it tight at the corners to remove any sagging. For many people, the idea of dedicating a specific wall to their projector screen may seem unnecessary. However, if you’ve set up your surround sound system and intend to use the projector often, having a reliable and always ready display can make a lot of sense. You can find all but the last two items at a hardware store. The screen paint and border tape are sold at specialty stores such as Screen Paint Supply. Using the sandpaper, smooth down the whole surface to remove any bumps and imperfections. Start slowly and use caution; you only want to remove slight imperfections. Apply the primer to the whole wall. Depending on the type of primer you use, you may need two coats. Wait for it to dry. Establish the size of your display area. To do this, set up your projector in its desired location and turn it on. Once you’re happy with the set-up, mark the desired display area with a pencil and long ruler. Mark up the area inside edges of the border with your painter's tape, following the pencil marks. Paint the outside of the display area with the darker paint. Wait for it to dry, then apply a second coat. Once dry, remove the painter's tape. Now is an excellent time to turn on your projector again, to ensure your display size is accurate. Using the painter's tape, mark the outside edges of the display. Make sure to cover the full lines so as not to leave any gaps along the edges. Apply the theater screen paint. Treat it the same as regular paint, but be sure to apply it carefully, covering the fully marked out area. Wait for the first coat to dry, then carefully apply a second coat. Wait for it to dry. Carefully apply the velvet projector border tape around the outer edges of the display area. The tape will help to absorb any excess light. If you like the idea of a projector screen you can hang or take down anytime you want, this is an excellent way to go. You can easily set up this projector indoors or outside. This setup is inexpensive to build and is lightweight and easy to move. However, you'll need to have a large enough space to store it when not in use. This guide is for a 16:9 7-foot wide screen with a 93-inch display area. Adjust to fit your space. Everything except the blackout cloth and border tape should be available at a hardware store. You can find the blackout cloth at a specialty store such as Carlofet, and the border tape at a store like Screen Paint Supply. Place one end of the 3-foot beam adjacent to the end of a 7-foot beam to create a 90-degree angle. Drill pilot holes to avoid splitting the wood then screw the beams together. Repeat this with the other end of the 7-foot beam. You'll now have a 3-foot beam attached at either end of the 7-foot beam. Secure the other 7-foot beam to the bottom, creating a rectangular frame. Attach the last 3-foot beam at the middle of your frame, creating additional support. Lay the blackout cloth across the frame ensuring the shiniest side is facing up; this will be the front of your display. To secure the blackout cloth, pull it as flat as you can then put two staples into the center of the bottom beam. Do the same at the top beam, being careful to pull the cloth taut but not so hard that it tears. Repeat this process on each side of the frame. You should now have eight staples pinning your blackout cloth to the frame: two at the middle top and bottom, two at the middle left side, and two at the middle right side. Avoid stapling too close to the edge of the boards since you'll have to trim the excess cloth and you don't want to have to cut too close to the staples. Now you need to secure the rest of the cloth. Add staples on either side of the first staples on the bottom beam while pulling the fabric taut. Repeat on the top and side beams. Move around the frame and repeat this process, always working away from the first staples. Remember to pull the blackout cloth tight and add only two staples at a time. Do this until the screen is fully secure and the screen is taut all the way across. While it might save time to staple down one side and then another, this will likely leave you with a slightly looser display that lacks tautness at the edges. Trim the excess blackout cloth. Carefully apply the velvet projector border tape around the outer edges of the display area, covering the staples. The tape will help to absorb any excess light. Turn the frame over and attach the picture hangers and cord. Affix a picture hook on the wall. Alternatively, hang it from a fixture on an outside wall for movies under the stars.